Unfortunately, the world of nonprofit development can be notoriously fickle and unfocused. Clearly we are in a major recession with no end in sight. The trick is not to panic. Here’s how you can meet your goals and, yes, even prosper in the upcoming year! 1. Stay the course. Develop a balanced, thoughtful budget approach which includes realistic goals for grants and corporate support, individual support, program support and events. Plan for “multiple streams of income,” yet with an eye to maximizing those activities which bring you the highest yield. 2. Retain staff.This one is key. I have worked with nonprofit organizations who have had – seriously – five development directors in three years! How can an organization have any kind of continuity with donors with that kind of record? Staff your organization with quality individuals and do your level best to keep them. If you’re not sending your development staff to workshops, classes and seminars, you’re doing your organization a grave disservice. Why are so many organizations reluctant to invest in education for their employees? Training enables and accelerates innovation. It’s good for the employee – it’s good for the employer. 3. Research, research, research. Foundation giving may be declining. On the other hand, it may not. Remember, foundations are created with the sole purpose of supporting philanthropic causes – regardless of the state of the economy. To maintain their legal status Foundations MUST donate an amount equal to 5% of their assets averaged over 5 years. Foundations also often INCREASE their giving in challenging times to offset decreases in giving from other sources. That said, you need to make it a practice to routinely scope out new sources of foundation funding. I was recently asked “well after so many years, don’t you run out of new potential foundation funders?” The answer is a resounding “no!” Not if you keep your eyes and ears peeled and engage in weekly research. 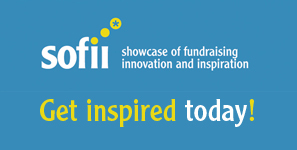 Develop a system where you’re sending out proposals or letters of inquiry to new foundations on a weekly basis. Build relationships. 4. Start a Monthly Giving Program. This one is a no-brainer and I am astounded that more organizations have not picked up on it. If you’ve got donors who are giving you $1,000, $100, even $25 every year, they’re prime candidates for a monthly giving program. The best book on monthly giving is Hidden Gold by Harvey McKinnon. Yet you needn’t think of this as a huge endeavor when you’re just starting out. Introduce it with your next annual appeal – as a P.S. Talk to your bank about an EFT option. Monthly giving has been a popular tool in the UK for years. Implement one now. Give donors the option of monthly credit card or checking account debits. And what rule says you can only mail once a year? Why not twice or even three times a year? 5. Refine (or Define) Your Story. Benevon calls it the organization’s “emotional hook.” It’s your nonprofit’s “story” – what makes donors give to you. The most compelling stories bring on the crocodile tears. Talk to your board members, talk to your clients, talk to your staff, talk to foundation funders and individual funders to find your emotional hook. Bring your mission to life. Think in terms of “multiple streams of income.” If you have a solid and engaged volunteer base, even smaller nonprofit organizations can host modest (but profitable) events, solicit donations and operate a neighborhood thrift store or sell on eBay. Many smaller organizations have their own used book stores, bringing in $25,000 to $50,000 extra yearly. Get creative! 7. Steward, steward, steward. It doesn’t have to be on a weekly or monthly basis but it absolutely needs to be consistent. Donors would rather be kept notified on a timely basis in a simple manner than receive a glossy magazine publication (that makes them wonder what the heck you are doing with their money) once every two years. A two to four-page quarterly or triennial newsletter is ideal. If you don’t have an email newsletter, now is the time to start. Now is the time to set aside an hour, two hours – whatever you can spare – every week to both phone and visit key donors one-on-one. 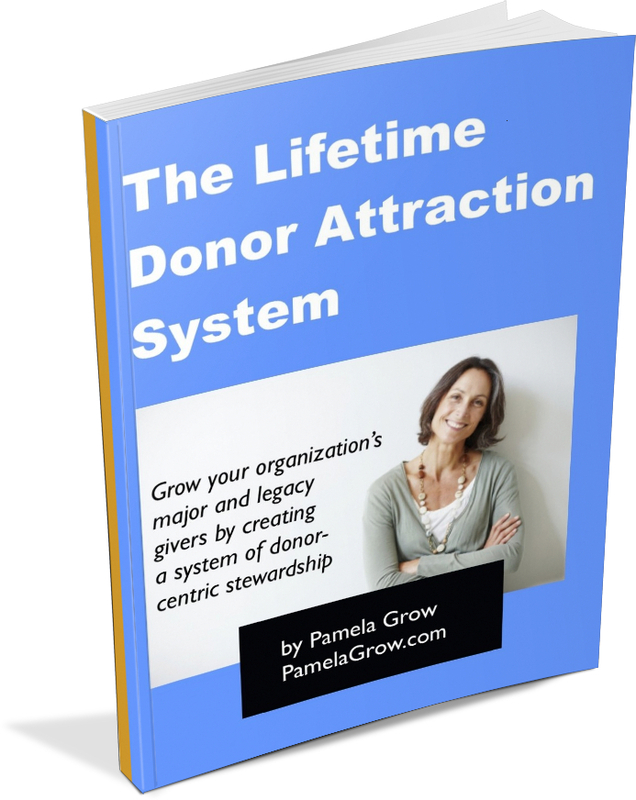 Don’t make that age-old mistake of only querying your donor database for your largest donors – pull up your most loyal donors and thank them, profusely. Focus on your organization’s most loyal donors – take them to lunch, to tea, drop by with a basket of home-baked goodies. Don’t panic and stay steady to survive – and prosper! Love it. Thanks for the reminders. Our monthly giving program continues to grow! Wow Pam, great post with lots of good info! The info about foundations having to donate to maintain their status was a real ah-ha moment. I also totally agree on keeping consistent staffing. I’ve seen many charities take a big step back simply because of turnover. Fundraising is a very personal business and so is volunteering; key staff members lead to consistent volunteers and donors. 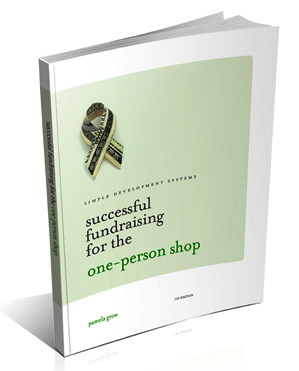 Great way to help nonprofits get off to a strong start in 2010, Pam! You hit the bulls eye once again! I agree with your assertion that “Training enables and accelerates innovation. It’s good for the employee – it’s good for the employer.” Done well,training is the seed-bed of creativity, excitement, and progress. Nonprofits need to consider fundamental changes in how they facilitate these opportunities to learn. Your point stuck out to me because it dovetailed so nicely with a recent piece I wrote about how nonprofits can change-up their organization to create an environment where associates are engaged with their work, and growing the “sweet spot” in their organizations through learning and collaborations. It’s at http://www.clienttrack.com/wordpress/?p=134 Thanks for the 7 tips. Thanks for mentioning the key word, RETENTION. I think many nonprofits lose sight of this. Get employee giving programs in place. Easiest to automate and EFT. You will do thank you notes once a year, and people who have $5 deducted from a monthly paycheck aren’t going to miss it, and your nonprofit will be able to continue to get new donors when they tell their coworkers about what you’re doing. Absolutely! Thanks for that great suggestion. I’m continually startled by the NPOs who allow a steady churn staff turnover. That’s a killer. I have to add, retaining the RIGHT staff. Sometimes NPOs keep people because it’s difficult to make a change. Thanks for commenting Steve. Agreed. I’m a strong believer that passion for the mission is one of the top criteria for hiring. I worked with an organization that, seriously, hired someone for an individual giving position who had no familiarity or even interest in the organization’s mission – just because he had some letters after his name. He lasted all of five months. All great points, Pamela. Thanks for sharing this great information and helpful reminders. So imporant for small development shops! A fabulous post. It reminds me that we, in many ways, need to run our non-profits like a business. Somehow many of us don’t think this way, leave out many important things we should be doing to run a non-profit, only to see the demise of our organization. I was seeing it with several non-profit orgs, but couldn’t quite see why. Thanks for the points! btw, i haven’t seen your blog before but found it through a “comment” on FB. I’m glad I stopped by to check you out. Wanted to subscribe but don’t see an RSS feed. Perhaps you can help me? One of my dream is founding NGO for helping people and animal. It was good info for me,thanks! Retention, retention, retention. Not that research shouldn’t be iterated 3 times. I just know that times are hard for everyone in a recession, and sometimes good people are hard to find. These seven tips are amazing! Thanks for sharing! I love your blog too!